Source: Wikipedia, "Metamorphic Force", available under the CC-BY-SA License. 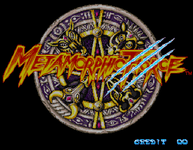 Metamorphic Force (メタモルフィックフォース?) was a 1993 arcade game made and distributed by Konami. It is a side-scrolling Beat 'em up game. The game was developed by the same team of the X-Men arcade game. An evil king has risen from the dead to rule the planet once more. But the souls of four guardians are inherited by four heroes, Ban, Max, Claude and Ivan, to fight the evil once again. The guardians wield the ability to shift into anthropomorphic beasts, augmenting more power as they fight their enemies. Athena (Top) sending from left to right: Ban, Claude, Max and Ivan.Ban(蛮), a Japanese Judoka. His guardian soul is a Fighting Bull, hence his beast form is a Minotaur. His signature color is red. Claude, a French swordsman. His guardian soul is a white wolf, and so his beast form is a white werewolf. His human form fights with a Sabre. Yellow is his signature color. Max, an American fighter with boxing style. His guardian soul is a black panther, and he predictably transforms into a panther-man. His signature color is blue. Ivan(Иван), a Russian Hunter with wrestling style. His guardian soul is a bear, so he transforms into a werebear in beast form. His human form fights with a small log. Green is his signature color. The game's four main characters, Ban, Max, Claude and Ivan, are able to morph into anthropomorphic "beasts" (referred to as Beast Mode) by collecting a golden statue power-up. The power-up drops from either a random chest that falls from the sky, or through an anthropomorphic mouse appearing at random times and supplying the player with either a POWER-UP or a Beast Statue. The mouse will drop power-ups after a certain period of time, or if the player attacks him, similar to the elves in Golden Axe. When the players collect a statue when already in Beast Mode, the character performs a "Screen Attack" which destroys all onscreen enemies (if the statue is collected during a boss fight, the boss is hit hard and usually twice, but they can survive). The enemies are also anthropomorphic animals such as frogs, elephants, lizards, hedgehogs, boars, and others, and include bosses like Baphomet and Ra. Model DD6 and Model DD7 of Konami's Bemani games originate from this game. Model DD6 is used in the boss battles here while Model DD7 is used on Stage 5's main boss. In two-player games, players can choose from a selection of the main characters. In four-player games, each main character is applied to his respective player position.